My children have had a little plastic playhouse for a long time. Both of them are now a bit too big for it and instead1 of playng in it they store things in there. They longed for a proper playhouse a place thet thy could both go to – a little space of their own but not so ‘babyish’ and small. I thought I would be looking at about £700-£1000 to get a tree house or anything resembling what they wanted and to be honest when I started researching I did find a lot of VERY expensive childrens playhouses. We settled on this one…..
I’ve just made a video log of the kids playing in it which I will edit and show you next week. But they love it, they absolutely love it. The house is very quiet! I think the prices are great! Obviously at that price you are looking at self assembly and we paid to have ours put together ( we are not a ‘handy’ family!) But nevertheless excellent value and a really good looking sturdy playhouse. Garden Buildings Direct sell far more than playhouses; they sell log cabins, sheds, summer houses, green houses and workshops. Shall I show you my fantasy garden workshop ? How lovely – I can just imagine it with a little desk and pc, a big vase of flowers, some journals and a mini firdge I would need a bigger garden and it would set me back £699 but oh it ould be divine! This is a lovely store with a wide variety of garden buildings to suit a range of budgets. Garden Buildings Direct Reviews are excellent and well worth checking out. 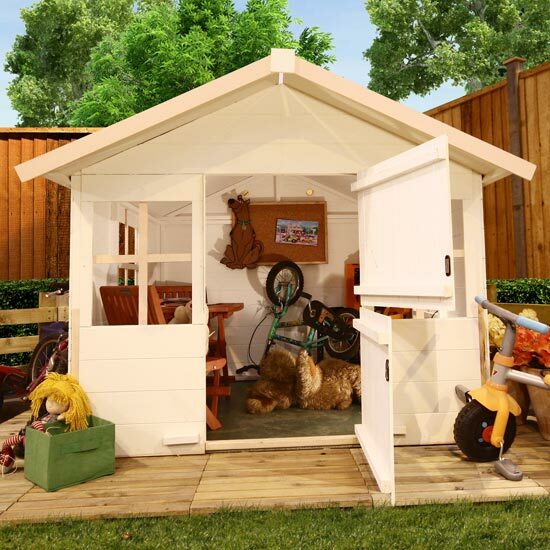 Garden Buildings Direct provided me with thie playhouse for the purpose of review. Thanks for the positive review Becky. The playhouse looks great!